I finished restoring my number 146 900 Replica and have done 4000 happy miles so familiar with square case 900. I've just bought a 750 Sport which needs running in. Looking for some guidance on things to look out for and oil change. Is there a maintenance book to read? I've got the spare parts list, bible and restoration guide but none talk about maintenance. Oil change, I'm going to do 500 miles whist running in, and use Chatsworth Steaight 40 same as my 900. There are two 'plugs' one on either side of engine. Left hand side looks like long gauze filter and is removeable without disturbing exhaust. There's one on the right. 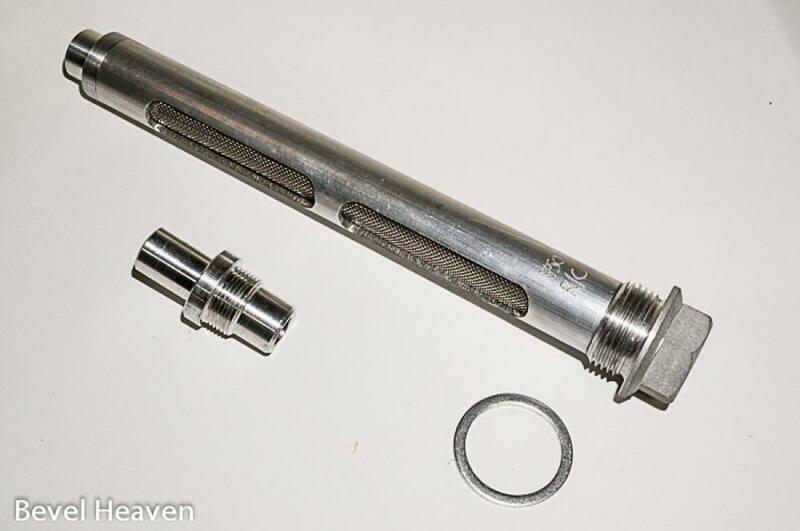 Spare parts show it as some form of hollow bolt to receive the end of the gauze filter. To remove it requires exhaust off. I'm guessing it doesn't need to be disturbed???? Is converting to a solid aluminium and gauze filter tube with pick up magnet recommended? Any other quirks with running in a round case with electronic ignition that I should watch out for? Many thanks for any and all response and guidance. Re: 900 Replica guy buys a 750 Sport. Advice sought? Blacklightning wrote: I'm guessing it doesn't need to be disturbed???? Blacklightning wrote: Is converting to a solid aluminium and gauze filter tube with pick up magnet recommended? I guess you mean one of these? Blacklightning wrote: Any other quirks with running in a round case with electronic ignition that I should watch out for? Many thanks indeed. you've been as helpful on the 750 as you were with me on the 900. I'm just off to post there about head bearings too, have a peek for me would you please?